After what was described as a normal takeoff roll, the aircraft lifted off. Upon establishing a positive rate of climb, the landing gear and wing flaps were retracted, and the engine power was reduced to the maximum except for takeoff (METO) setting. The aircraft was now gaining altitude, flying on instruments without outside visibility as it headed over Flushing Bay. While the aircraft's clearance instructed that it proceed northeast on a heading of 40° (runway heading), the airplane began a gradual turn to the left. When it had reached a heading of 285° (nearly due west), it overflew Rikers Island. Its altitude was insufficient to clear the trees on the island, and the aircraft crashed, coming to rest within 1,500 feet of the point of first impact. The duration of the flight from takeoff to crash was approximately 60 seconds. The crash resulted in twenty fatalities and seventy-eight injuries among the passengers and several injuries but no fatalities among the crew. Northeast Flight 823 to Miami (MIA) was scheduled to depart from New York-La Guardia (LGA) at 14:45. Snowfall delayed the departure. 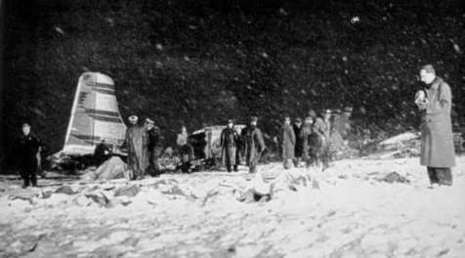 Carrying 95 passengers and 6 crewmembers, the gross weight of the aircraft was 98575 pounds, 265 pounds below maximum weight. The crew started the takeoff roll on runway 04 at 18:01. Except for some sliding of the nose wheel at low speed, the takeoff roll was normal. A positive rate of climb was established and the gear was retracted, flaps raised and METO power set. The crew went on instruments immediately after gear retraction and the captain monitored airspeed, rate of climb and direction. the aircraft was to climb on runway heading, but started turning to the left. This was not noticed by the crew. While over Rikers Island on a 285deg heading, the DC-6 first struck small trees. The left wingtip touched the ground; the right wingtip 150 feet beyond. The plane then skidded 1500 feet. Impact occurred about 60 seconds after the start of takeoff. 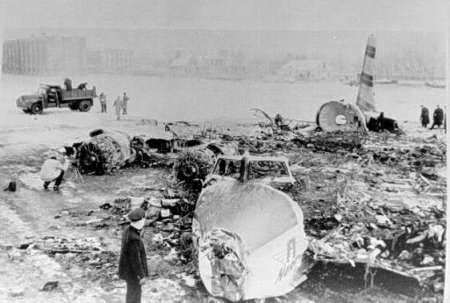 Northeast Airlines Flight 823, a Douglas DC-6A, N 34954, crash landed on Rikers Island, New York, at 18021 on Feb. 1, 1957. The accident occurred at night under IFR [Instrument Flight Rules] conditions less than one minute after takeoff from runway 4, La Guardia Field, New York. There were 101 persons aboard the aircraft -- 95 passengers (which included 11 children) and six crew members. Of these 20 passengers received fatal injury, 25 passengers and three stewardesses serious injury, and 50 passengers minor injury. The pilot, copilot, and flight engineer were uninjured. Six official agencies -- with help volunteered also by the FBI -- joined today in an effort to peg the cause of last night's crash of a Northeast Airliner carrying 102 persons. Twenty persons died in the flaming debris. The big four-engined craft, laden with passengers happily contemplating reaching balmy Miami in few hours, thundered to earth moments after taking off from La Guardia Airport in a swirling snowstorm. Of the others aboard, 64 were taken to hospitals, 18 more went home after being attended for injuries. The remainder emerged unscathed. It seemed that only a miracle prevented all from perishing.